Three writers will come together with three neuroscientists whose research focuses on language for a one-day symposium to explore the connection between the creative process and relevant brain mechanisms. The symposium is in conjunction with Krish Sathian and Laura Otis’s graduate course "Images, Metaphors and the Brain," and includes writers Salman Rushdie, Jim Grisley and Joseph Skillbell and neuroscientists Anjan Chatterjee, Seana Coulson and David Kemmerer. Linguists and psychologists have debated how much the parts of the brain that mediate direct sensory experience are involved in understanding metaphors. George Lakoff and Mark Johnson, in their landmark work ‘Metaphors we live by', pointed out that our daily language is full of metaphors, some of which are so familiar (like "rough day") that they may not seem especially novel or striking. They argued that metaphor comprehension is grounded in our sensory and motor experiences. "We see that metaphors are engaging the areas of the cerebral cortex involved in sensory responses even though the metaphors are quite familiar," says senior author Krish Sathian, MD, PhD, professor of neurology, rehabilitation medicine, and psychology at Emory University. "This result illustrates how we draw upon sensory experiences to achieve understanding of metaphorical language." In a previous study, the researchers had already mapped out, for each of these individuals, which parts of the students' brains were involved in processing actual textures by touch and sight. This allowed them to establish with confidence the link within the brain between metaphors involving texture and the sensory experience of texture itself. "Interestingly, visual cortical regions were not activated by textural metaphors, which fits with other evidence for the primacy of touch in texture perception," says research associate Simon Lacey, PhD, the first author of the paper. 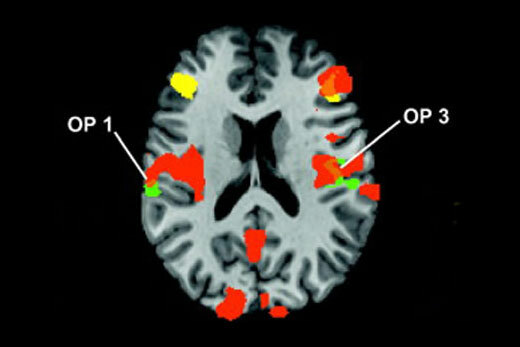 The researchers did not find metaphor-specific differences in cortical regions well known to be involved in generating and processing language, such as Broca's or Wernicke's areas. However, this result doesn't rule out a role for these regions in processing metaphors, Sathian says. Also, other neurologists have seen that injury to various areas of the brain can interfere with patients' understanding of metaphors. "I don't think that there's only one area responsible for metaphor processing," Sathian says. "Actually, several recent lines of research indicate that engagement with abstract concepts is distributed around the brain." "I think our research highlights the role of neural networks, rather than a single area of the brain, in these processes. What could be happening is that the brain is conducting an internal simulation as a way to understand the metaphor, and that's why the regions associated with touch get involved. This also demonstrates how complex processes involving symbols, such as appreciating a painting or understanding a metaphor, do not depend just on evolutionarily new parts of the brain, but also on adaptations of older parts of the brain." Sathian's future plans include asking whether similar relationships exist for other senses, such as vision. The researchers also plan to probe whether magnetic stimulation of the brain in regions associated with sensory experience can interfere with understanding metaphors.